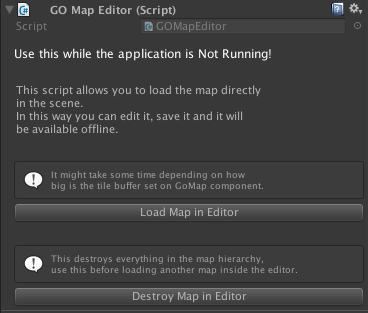 With GO Map you can preload the map inside your scene and not use it live with gps. This feature allows you to create awesome real world cities to set your game in. To load a map in your scene just add this component to an already attached GOMap script and press the “Load Map in Editor” button. To destroy it and create a new one press the Destroy button. Once the map is loaded you can edit it, save it (as a scene), and place your game in it. Tip: After you have loaded the map remember to remove the GOMap script to prevent it reloading the map. Some users asked me if it was possible to load a map in the scene, then build the game to a device and use it with GPS. If you read the chapter of this documentation about the world origin you probably have understood that the GOMap gameobject position is always 0,0,0 but the map tiles are loaded and positioned accordingly to the world origin. So it’s really a mess to have the user move onto a preloaded map. I have made a simple script named GOPreloadedMap.cs that you have to attach to the map gameobject replacing the GOMap component. Enter in the “centerCoordinates” filed the exact same values you had set in the location manager when you loaded the map in the scene. Now when you run the scene you’ll that the map will reposition accordingly to your GPS position and the current world origin. That’s no easy to understand stuff so It’s normal that you are going to have some troubles to make it work properly, and maybe you’ll have to test your scene a lot more that a usual GO Map build. Choose this solution only if you really have to change details in the map (once it’s loaded) and then use it with GPS. Otherwise if you just need an area to be cached in the app at first load please consider the solution explained in the “Preload map tiles in the cache folder” chapter”.